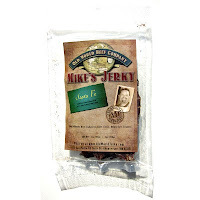 Next in the series on Mike's Jerky is this Santa Fe variety. See my previous review of their Black Pepper. 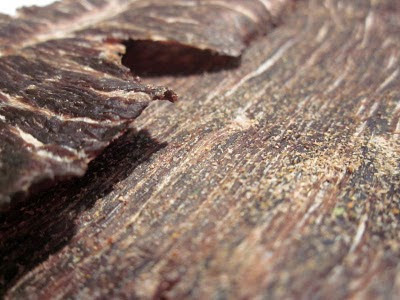 Mike's Jerky is a brand of Old World Beef Company based out of Albuquerque, NM. The company was started by Mike and Brenda Grier in 2008. The couple had been making jerky for many years and were always told that they ought to go into business selling it, except they were already busy running an RV dealership. But when the bad economy hit, their dealership went out of business, and that cleared the way for them to start Old World Beef Company. This Santa Fe variety is described by the company as "A taste of the Southwest! A very flavorful blend of seasonings with a touch of habanero for a nice little kick." Beef, habanero, chile, garlic, onion, salt, cilantro. The first thing I taste from the surface of these pieces is a very light saltiness, followed by a light onion. The chewing flavor starts with more saltiness, a stronger onion, and a lot of natural meat flavor. There's just a smidgeon of chile pepper flavor. For being labeled as "Santa Fe", this jerky doesn't seem to convey that sense of Santa Fe, or southwest style flavor. When I think of southwest style cooking, I think of something spicy and bold which I don't really get in this. But I always associate Santa Fe style flavors as having a lot of chile pepper flavor, considering New Mexico's reputation for great chile peppers. And then considering how Mike's Jerky described this variety as "touch of habanero for a nice little kick", I don't pick up any kick at all. Albeit, I like to eat a lot of hot foods, so maybe I'm not as sensitive to it. I did, however, mention further above getting just a smidgeon of chile pepper flavor, but that's only when I analyze carefully what I'm tasting. When just snacking away, I don't really notice it. Instead what I taste is a lightly salty onion seasoning. Which when combined with the strong natural meat flavors is still quite tasty. The natural meat flavors resemble something like slices of roast beef you get from the deli. If you could imagine sprinkling that with some salt and onion seasoning, that's largely what you might expect to taste in this. These are slices of whole meat, sliced very thin, and in small to medium sized slabs. This is a dry jerky, with a dry surface feel. It has no flexibility, being quite brittle, and will snap apart with a little bit of bending. It's very easy to tear pieces apart, and very easy to chew. The chewing texture starts out feeling dry and brittle with no chewing resistance. I get a good deal of crunch chewing a piece down, and its chews down to a soft mass very quickly with little effort. At that point it feels very much like a piece of roast beef deli cut, but a little more dry. I can see several spots of fat on these slabs, but they offer no additional flavor and no additional chewing texture. One piece contained a large streak of gristle with fat mixed in. But this jerky is thin and dry enough that the gristle seemed to chew fairly easily enough. In terms of clean eating, these seem very clean. My fingers picked up no residue, though snapping off pieces dropped just minimal amounts of meat fragments and pepper. 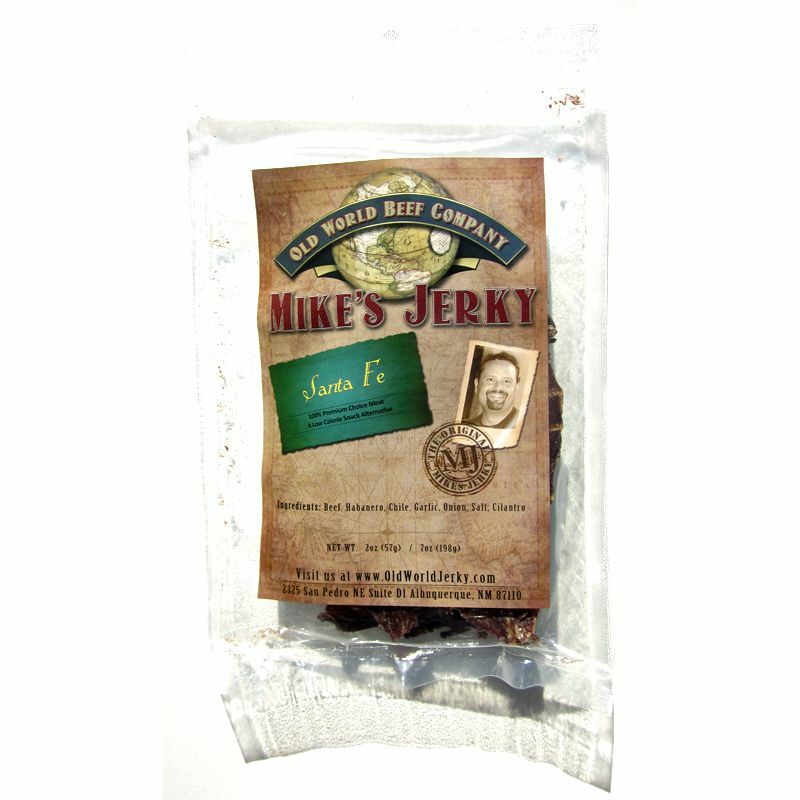 Mike's Jerky sells this Santa Fe variety from its website at a price of $5.00 for a 2oz package. If you bought 8 packages, the shipping works out to $5.38 if sent to Southern California. That comes to $2.84 per ounce. For general jerky snacking purposes, at the $2.84 per ounce price, it's a decent value. I'm getting a good deal of snackability for an overall good flavor, average meat consistency considering the large streak of gristle in one piece, and good chewing texture. That price is a lot higher than what you'll pay at the grocery store for one of the major brands, but I think you'll get more snackability out of this. As a Santa Fe beef jerky at the same $2.84 per ounce price, it's a poor value. I don't really identify anything in this with that of Santa Fe flavors or giving me any taste of the southwest. And then considering the price is substantially higher than many other beef jerky brands in general, I don't feel it gives you any Santa Fe value for your money. This Santa Fe variety from Mike's Jerky didn't provide any kind of flavor that I would associate with Santa Fe or southwest. When I think of Santa Fe, I usually think of chile peppers, and something having a bold, spicy flavor. This doesn't have any of that. If I didn't know what this jerky was labeled as, I would have guessed it was a lightly salty onion seasoning. But on its own merits, I still found it to be quite tasty. I think it starts with the natural meat flavors which remind me of deli roast beef, and it seems to have a fresh, clean flavor. I also found the thin, crunchy character of the meat to generate a lot of snackability. 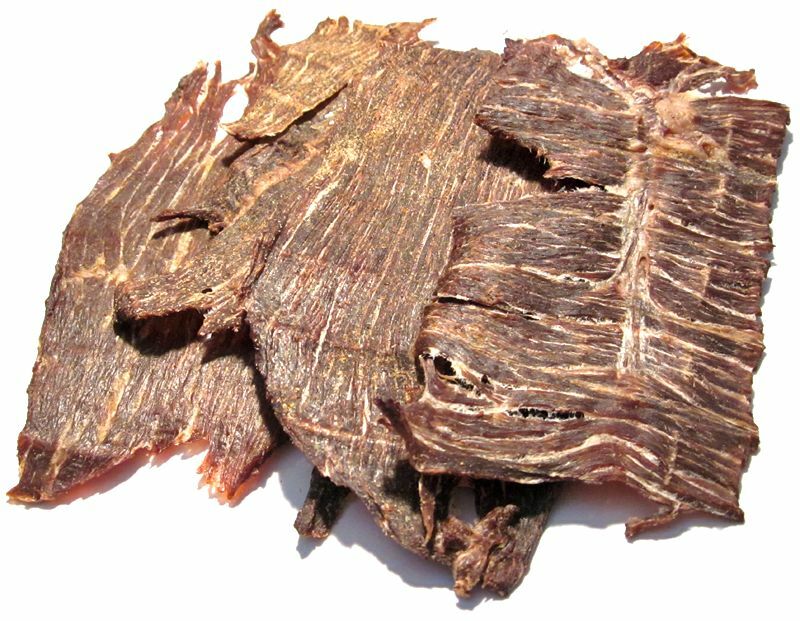 Overall, it's a lightly flavored jerky, but still manages to generate a lot of snackability for its meat consistency, chewing texture, and fresh, natural meat flavor. My recommended beer pairing for this, I'd go with something heavier on the malt to add a sweetness to it, but am wanting a red ale of some sorts. Try the Karl Strauss Red Trolley, or the Hangar 24 Alt-Bier. Santa Fe is one of my favorites from Mike's Jerky! Im glad you had the opportunity to review it.